Many areas in a yard or landscape are shady. When planning your garden's shady areas, you are not only limited to green plants. Many flowers can do well in shady or partly sunny areas. Many plants that do well in shade need to be kept regularly moist, and some need to be watered primarily in the morning. Fuchsia is a shade tolerant flower that grows to between 1 and 2 feet tall. It grows well both in partial sun and in shade. Fuchsia's flowers are red, pink and white and often mix on a single plant. Fuchsia grows best in fertile, well draining soil. Keep the soil moist at all times, but don't over-water and allow the soil to become wet. Fuchsia grows well both in garden beds and in pots. If planting in beds, space the plants 6 to 8 inches apart. Fuchsia flowers between July and October. 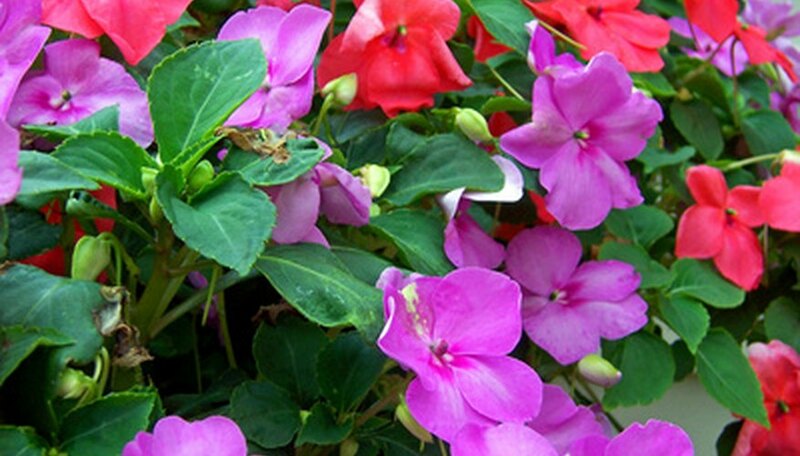 Impatiens are plants that produce large flowers on small plants in a variety of colors, including orange, salmon, pink, red, white, purple and a number of other colors. They begin blooming in June and often bloom through October. These flowers thrive either in partial sun or in full shade. Impatiens do best in well draining, fertile soil with a lot of organic matter. Water your impatiens frequently, and don't plant in hot, dry locations. Impatiens do well in pots and in beds. If planting in beds, plant them about 15 inches apart. Begonias, especially non-stop begonias, are tolerant of shade. They do, however, also do well in partial sun. Non-stop begonias bloom constantly and can grow to 8 inches high. These flowers feature brightly colored blooms with dark foliage. Begonia flowers are yellow, red, orange, yellow, pink and white. They do well either in pots or in flower beds. If planting in flower beds, space the plants about a foot apart. Add compost or humus to the soil before planting, and keep the soil moist. Water these plants in the morning to help prevent mold and mildew issues. What Flowers Will Rabbits Not Eat?